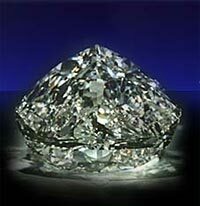 At 530.20 carats the Cullinan I or Star Africa diamond is the largest cut diamond in the world. Pear-shaped, with 74 facets, it is set in the Royal Scepter (kept with the other Crown Jewels in the Tower of London). It was cut from the 3,106-carat Cullian, the largest diamond crystal ever found. The Cullian was discovered in Transvaal, South Africa in l095 on an inspection tour of the Premier Mine. The Cullian was cut by Joseph Asscher and Company of Amsterdam, who examined the enormous crystal for around six months before determining how to divide it. It eventually yeilded nine major, and 96 smaller brilliant-cut stones. When the Cullian was first discovered, certain signs suggested that it may have been part of a much larger crystal. But no discovery of the "missing half" has ever been authenticated. Probably the second largest stone ever found (if the lost Braganza cannot be found and authenticated). A high-clarity, blue-white stone, it was found in l893 by a South African mine worker who picked it out of a shovelful of gravel. 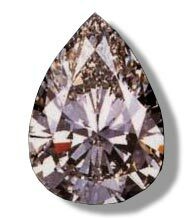 Because of its irregular shape, it was cut into 21 polished stones, of which the largest was a marquise of 69.80 carats. A smaller, 18-carat marquise stone cut from the Excelsior was displayed a the l939 World's Fair by De Beers. The Orloff is thought to have weighed about 300 carats when it was found. At one time it was confused with the Great Mogul, and is now held in the Diamond Treasury of the former Soviet Union in Moscow. One tale told is that the Orloff was set as the eye of a god in the temple of Sri Rangen and was stolen by a French soldier disguised as a Hindu. 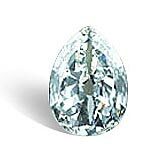 This pear-shaped 69.42 carat diamond was sold at auction in 1969 with the understanding that it could be named by the buyer. Cartier of New York successfully bid for it and immediately christened it "Cartier." However, the next day Richard Burton bought the stone for Elizabeth Taylor for an undisclosed sum, renaming it the "Taylor-Burton." It made its debut at a charity ball in Monaco in mid-November where Miss Taylor wore it as a pendant. In 1978, Elizabeth Taylor announced that she was putting it up for sale and planned to use part of the proceeds to build a hospital in Botswana. Just to inspect the diamond, prospective buyers had to pay $2,500 to cover the cost of showing it. The Hope Diamond receives its name from, Henry Thomas Hope. Long before the fabled bad luck associated with its owners, the Hope Diamond has an illustrious history. It was discovered centuries ago in southern region of India, where it was believed to have a great mystical powers that surrounded this unusual size and unique color, a deep indigo blue. The Hope was reputedly used to adorn the statue of a Hindu idol. In 1642, the famous Blue Tavernier Diamond from Europe, was in the hands of King Louis XIV who had it cut to bring out its brilliance. Later, the diamond was discovered stolen during the French Revolution. For many decades, the Hope Diamond could not be found. It was rumored, according to legend, that the blue stone, which sultans, Kings, English royalty, Jewelers and thieves had previously acquired the stone. Some say, those who owned the blue stone, had some kind of bad luck associated with them where ever they went. At the turn of the century, in 1911 the diamond was purchased by a young American socialite heiress named Evalyn Walsh McLean who bought the Hope Diamond from Cartier for $185.000.00. This gift was given to Evalyn by her husband Ned, who owned the Washington Post and Cincinnati Enquire newspapers. Evalyn supported the diamond every where. For instance, wearing it in the swimming pool, allowing her great Dane to wear it around the house to protect, loaned it to brides for their special day and allowing her grand daughter, Mamie, to play with it in her sand box and teething on it. Evalyn too saw her share of tragedy. She was ultimately convinced that the true power of the Hope Diamond came from the joy and awe which filled the faces of those who gazed upon it. Mrs. McLean, was the longest private owner and she owned the diamond for 36 years until her death in 1947. When Harry Winston Jewelers of New York, a diamond merchant, bought the Hope in 1949 from the estate of Evalyn Walsh McLean, many clients refused to touch the stone. In 1958, the Hope was given a permanent home at the Smithsonian Institute in Washington D.C. Today, the Hope Diamond can be enjoyed be millions of people who can see the most sought after exhibit in the world and the most valuable stone in the world. Worth, quarter of a billion dollars. ($250.000.000.00) To learn more about the personal side of Evalyn Walsh McLean and the Hope Diamond, you can log on www.fable-hdc.com and the fairy tale story will fascinate you just like others have come to enjoy year after year. The name of this diamond means "Montain of Light" and its history, dating back to1304, is the longest of all famous diamonds. It was captured by the Rajahs of Malwa in the sixteenth century by the Mogul, Sultan Babur and remained in the possession of later Mogul emperors. It may have been set in the famous Peacock Throne made for Shah Jehan. After the break-up of the Persian empire the diamond found its way to India. It may have traveled to Afgahnistan with a boydyguard of Nadir Shah, who fled with the stone when the Shah was murdered, to be later offered to Ranjit Singh of the Punjab in exchan ge for military help (which was never delivered). After fighting broke out between the Sikhs and the British, The East India Company claimed the diamond as a partial indemnity, and then presented it to Queen Victoria in 1850. When the stone came from India, it weighed l986 carats; it was later recut to l08.93 carats. It was first worn by the Queen in a brooch. 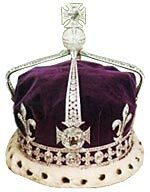 It was later set in the State Crown, worn by Queen Alexandra and Queen Mary, and 1937 was worn for by Queen Elizabeth for her coronation. It is kept in the Tower of London, with the other Crown Jewels. In the Mbuji-Mayi district of Zaire, a perfect rough diamond weighing a lucky 777 carats is discovered by an alluvial digger. He approaches a local De Beers buyer, who immediately recognizes its extraordinary beauty. The cutting of the Millennium Star set international precedence in the diamond industry. Only the world's leading diamond cutters were given the opportunity to work on this stone. The flawless, elongated rough stone was painstakingly transformed into a classic pear-shaped gem of unbelievable brilliance. In celebrating the new Millennium, the De Beers Millennium Star was placed on display for a year in the new Millennium Dome in London. In this way, De Beers celebrated the Millennium by sharing its passion for diamonds with the world. An interview with the late Harry Oppenheimer, former Chairman of De Beers: "I am delighted to think that De Beers could mark the Millennium from the point of view of diamonds." The De Beers Millennium Star was so beautiful and enticing that on November 7, 2000 a robbery attempt was made, resulting in a moment reminiscent of the "Great Train Robbery" caper. Using a bulldozer, nail guns and smoke grenades, the would-be robbers plowed towards the exhibit featuring the Millennium Star, smashing a gate on the way. A boat stood by, moored on the Thames, for the getaway. Once inside the exhibit, the thieves were foiled by Scotland Yard's Flying Squad, who had been tipped off previously, and were posing as cleaners. They were arrested without any injuries. The robbers were disappointed to learn that the Millennium Star had been replaced the day before by a replica, and are now serving time at Her Majesties Pleasure. In 2001, De Beers LV purchased the Millennium Star to be the flagship of the new De Beers diamond jewelry collections. Hidden away for many months since the robbery attempt, the stone reappeared at the Cannes Film Festival in May 2002. The Millennium Star was set in a stunning necklace of over 200 pave diamonds worn by style icon Iman at the Cinema Against Aids charity dinner and auction. 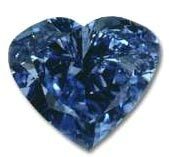 This 27.64 carat heart-shaped stone is renowned for the intensity of its color, described by experts as "vivid blue." The Heart of Eternity was one of 11 rare blue diamonds unveiled to the world in January 2000 as part of a special collection of De Beers Millennium Jewels. This collection, which also featured the famous Millennium Star, was gathered by the De Beers Group over many years to celebrate the new millennium. Discovered at the Premier Mine, in July 1986, the 'Centenary' diamond weighed 599.10 carats in the rough. Together with a small select team, master-cutter Gabi Tolkowsky took almost three years to complete its transformation into the world's largest, most modern-cut, top-colour, flawless diamond.